#iDIDit: What is a DID? [Informative] A DID Entity is a data structure comprised of a collection of key-value pairs with keys such as: id (DID), service (endpoints), authentication, publicKey, @context, etc. A DID Document is a JSON-LD serialization of a DID Entity. The id (DID) attribute is the unique identifier or key for the DID Document. id (DID) are used to index, find, and retrieve DID Documents from the Technology Layer. 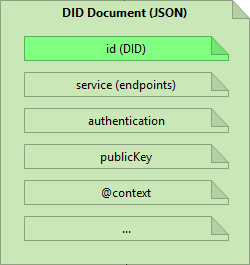 id (DID) exists as an attribute of a DID Entity (and by implication, as an attribute of DID Document, the JSON-LD serialization of the corresponding DID Entity). When DID Documents, in turn, are serialized to the Indy Ledger by Indy Ledger Nodes, they are stored as a series of Indy Ledger Transactions. Edge Agents and Cloud Agents call an Indy Ledger Node to persist a DID Document to the Indy Ledger. DID Documents, specifically, are written to the Indy Ledger by the Indy Ledger Nodes using Indy NYM and Indy ATTRIB transactions.